- News Analysis The Hindu New Delhi Sept. 1. Historically, Tibet has been the bridge between the two ancient civilisations in India and China. But as the two nations stepped out into the modern world in the middle of the last century, Tibet immediately became the bone of political contention between New Delhi and Beijing. Differences between the two on their respective relations with Tibet cast a dark shadow over Sino-Indian ties and eventually led to the war in 1962. Despite the continuing effort over the last decade and a half to normalise bilateral relations, Tibet remains the lump in the throat of Sino-Indian ties. It can neither be spat out nor swallowed. Must Tibet remain forever a barrier between India and China? Not necessarily. Some creative diplomacy from New Delhi and Beijing could help restore Tibet to its natural role as the land bridge between the two nations. The massive changes in China and Tibet over the last two decades have unexpectedly opened the door for a realisation of India's long-standing political objectives - autonomy for Tibetan people and the protection of their unique culture that is deeply linked to the Indian civilisation, and preserving the special historic ties between New Delhi and Lhasa. The diplomatic challenge lies in reframing these issues for the new political environment of the 21st century. Over the last five decades, Beijing has largely won the point that Tibet is an integral part of China. But it also had to move away from the repression of Tibet from the late 1950s towards more liberal and accommodative policies from the early 1980s, when Deng Xiaoping launched China on the path towards rapid modernisation. Even as it transforms the economic conditions in Tibet, China knows it still needs a final political settlement with the Dalai Lama who has lived in exile in India for more than four decades. The Dalai Lama himself has given up the notion of independence and is willing to explore the objective of "genuine autonomy''. The debate today between the Dalai Lama and Beijing is about the terms of such a dialogue and not its necessity. There have been some interesting contacts between the two sides in recent years. The most recent was the ``personal visit'' a few weeks ago of Gyalo Thondup, the Dalai Lama's elder brother and occasional emissary to Beijing, to Tibet for the first time in five decades. After his visit, Mr. Thondup has spoken positively about the changes in Tibet and sounded upbeat about the prospects of a dialogue between the two sides. It is in India's interest to encourage both sides to begin talks at the earliest. A substantive dialogue between Beijing and the exiled Tibetan leadership would dramatically alter the template of Sino-Indian relations. The historic trading and pilgrimage rights that India enjoyed before the Chinese entry into Tibet were suspended amidst the deteriorating relations between the two in the late 1950s. Today, India is in a position to regain those privileges, not as a matter of legal right derived from past treaties, but purely from the economic logic of globalisation. As China set out on a strategy of peace and development from the early 1980s, Beijing creaked open the door for Indian pilgrims wanting to travel to Mount Kailash and Lake Manasarovar. But now, as China seeks to globalise Tibet, it is ready for larger flows of Indian tourists and pilgrims. Even more important, globalisation and the geography of Tibet have made it imperative for Beijing to explore expanded trade relations between the region and its neighbouring countries. And India is the biggest neighbour of Tibet. The time has come to open up and upgrade the historic trade routes between India and Tibet. 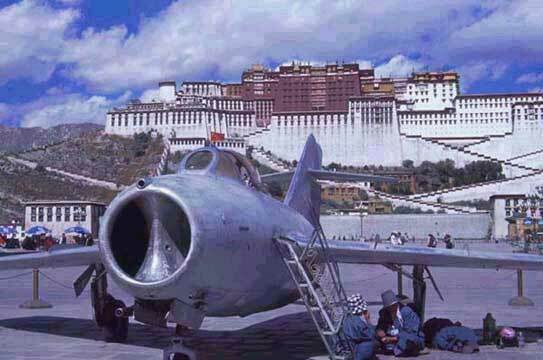 Well into the 1950s, Tibet depended on India for the supply of many of its day-to-day essentials. Tibet is, indeed, far more integrated into the Chinese economy today than in the 1950s. Nevertheless, there is a huge market in Tibet and its bordering Chinese provinces that India today could explore. As interesting possibilities emerge for reviving the movement of goods and people across the Indo-Tibetan border, it is serendipitous that the current Indian envoy to China, Shiv Shankar Menon, has a special personal link to Tibet. Mr. Menon spent some years of his childhood in Tibet, when his father, P.N. Menon, who was in the Indian Foreign Service, was posted as the Consul General in Lhasa in the early 1950s. Arvind Deo, who later served as ambassador to Nepal, was the last Indian Consul in Tibet. Re-establishment of the Indian consulate in Lhasa, shutdown in December 1962, should no longer be a distant dream, as New Delhi and Beijing discover the mutual benefits of making Tibet a bridge between the two nations.